Of course it does! There are many different types of grease for many different uses. Some greases are formulated for high-pressure, metal-on-metal applications (such as molybdenum grease, also called moly grease) whereas others are formulated for high speed use in bearings. Mixing incompatible greases leads to grease hardening, where the mixture just ends up being a big hard lump – or it causes the grease mixture to soften into a runny mess. Either way is probably going to be expensive to repair or replace. As well as just about any other heavily-loaded, low-speed application. It is also serves as a good multi-purpose grease. Its exceptional ability to reduce friction, however, makes it unsuitable for high-speed bearings (such as needle or roller bearings), as the rollers/needles need a small amount of friction in order to rotate a full 360° and perform as they should. Otherwise, they develop flat areas along the length of the rollers/needles and eventually stop rotating, thereby reducing the bearing's performance and resulting in a sooner than expected replacement. Lithium grease is also available in white so that one may easily see the amount of new grease that has been added. 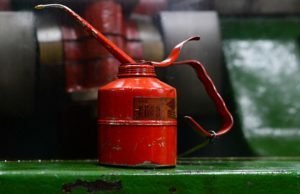 The group of lithium greases also includes "red" grease, which is a very heavy-duty, water resistant type that can stand up to extreme temperatures and tolerate a lot of wear and tear. Calcium sulfonate greases are generally used where exposure to water is either constant or at least inevitable. They are well-suited for marine environments, provide a barrier to corrosion, good stability and bonds well with metal, meaning it won't wash away with the first splash. As an additive, calcium sulfonates have been used for several years in automotive undercoating because of its corrosion-inhibiting nature. Use it on boat trailers, anchor chain reels, winches, pins, etc. Polyurea-based greases are multi-purpose greases that do well in long-service uses (such as "sealed-for-life" bearings, electric motor bearings, high-temp pump bearings, etc.) and perform well in extreme pressure and high temperature applications. They are also water resistant. Polyurea greases are used in many other bearing applications, including automotive, pulleys, CV joints, high-speed bearings, etc. This type of grease is also used in environments where noise reduction is required.